While I was in Orlando I wanted to try and take advantage of as many things as I possibly could. Seeing as this trip was very Disney-centric and I hadn’t been in eons (there were only two parks when I went) I wanted to try and take advantage of everything that park had to offer. One thing I wanted to find out more about was Downtown Disney, which seemed on my knowledge to be Disney’s answer to CityWalk at the Universal Parks. To a large extent I was right and I discovered that there at Downtown Disney there was an AMC 24, which I was likely to attend regardless, however, what was surprising and unique about this one is that four screens were siphoned off to a separate section of the theater and offer a dine-in experience. Eating and the movies have been linked since the very beginning but never had I heard of such a literal take. I was so intrigued I had to try it. To be honest I was surprised once I was introduced to the notion why it isn’t more prevalent as concessions are where exhibitors make most of their money. 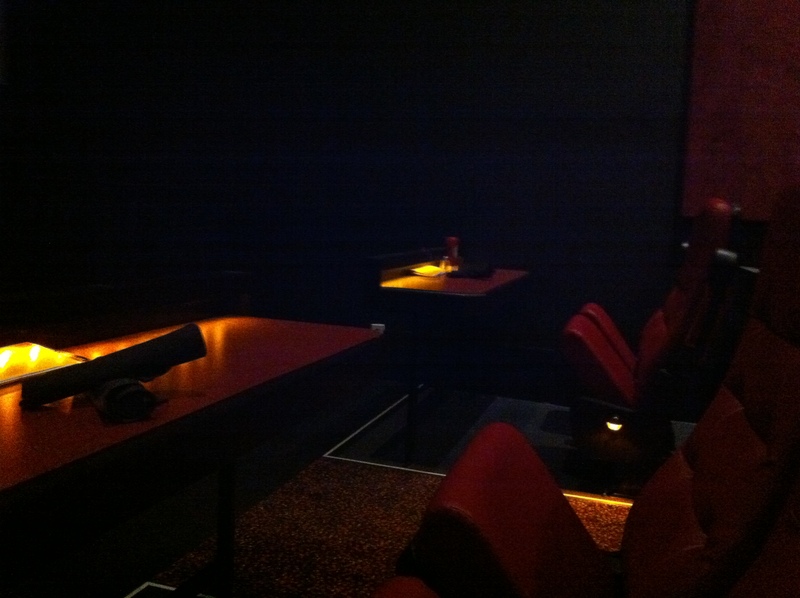 Yes, I was are of places like the Alamo Drafthouse but it’s not set-up like this. Sadly, we were getting informed very late and deciding on the fly so it was a rushed arrival and film choice was limited at that time of night but it needed trying. Essentially you book your seat (much like in a restaurant or in a theatre where they have reserved seating) and there is a bar-table across your row. There’s salt and pepper already there, ketchup, cutlery and a napkin. The seat is incredibly comfortable like the finest stadium seating has to offer. An added bonus is that there’s a footrest underneath to improve the reclining experience. What I had was a fruit salad, which was rather fresh and big (it’s easy to do but doesn’t often happen with fruit salad), an order of French fries (generous portions and above average in quality) and cake lollipops for dessert (a first so I have no frame of reference but the cake was incredibly moist and the coating delectable). The soda sizes, since it’s a movie theatre whose large is a tub-o-soda, are also plentiful and I believe refills are free. The wine list is rather good considering the kind of joint it is, however, what must be taken into account are pricing (it’ll add to your per-head total) and do you want to drink during said film, usually my answer to that is no. I might suggest you do two courses if you’re watching your spending, as it was a vacation it wasn’t as much of a concern. I have a tendency to love the first row, which had my party nicely isolated from the crowd but it did make viewing/eating more challenging. You are accustomed to a box and a soda in an armrest when you factor in utensils and plates there are more machinations that divert your eyes. However, it was a very pleasurable experience overall, regardless. It’s one I’d recommend anyone try once and that I’d like to try anew. For information such as menu and locations please visit AMC’s site.